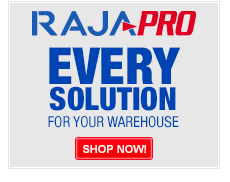 From plastic storage bins and crates to packing benches, pallet trucks and warehouse racking, Rajapack has everything you need to improve productivity and space efficiency in your warehouse. So if you’re looking for warehouse equipment that will save space and time, you’ve come to the right place. Rajapack have experts in-house to help you make the most of your space. They can offer advice and recommendations tailored to your specific packaging and storage needs. And because Rajapack stock a huge range of warehouse equipment, we can help you put your new packaging solution into action.